The thing I might love most about my job is all the weird things I learn during research. I'm working on a painting of Rapunzel right now, so I dusted off my leather-bound edition of Grimm Tales and found Rapunzel somewhere in the hundreds of tales within. Like most American children, I thought the poor girl had been named after radishes, and I always thought that was a bit stupid and I wondered why anyone would name such a beautiful baby after such a weird vegetable. But the truth is, Rapunzel was not named for radishes. 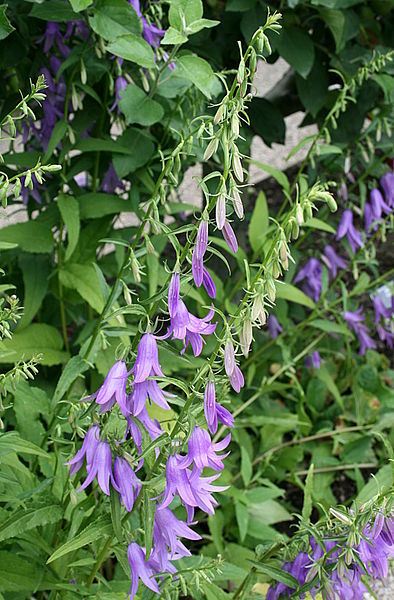 She was named for Rampion, a purple wildflower with leaves similar to spinach and a root like a turnip or radish. Aha! Now things make more sense! And I have something far prettier than a radish to include in my Rapunzel painting!